The world’s largest e-commerce retailer said it employed 45,000 robots in some 20 fulfillment centers. That’s a cool 50 percent increase from last year’s holiday season, when the company had some 30,000 robots working alongside 230,000 humans. Amazon.com hires a lot of people. But the expansion of its army of orange-wheeled robots is more than keeping pace. The world’s largest e-commerce retailer said it has 45,000 robots in some 20 fulfillment centers. That’s a bigger headcount than that of the armed forces of the Netherlands, a NATO member, according to World Bank data. It’s also a cool 50 percent increase from last year’s holiday season, when the company had some 30,000 robots working alongside 230,000 humans. We don’t know yet how many people Amazon is employing in the fourth quarter (that number is expected to be disclosed at the company’s earnings call in early 2017) so we can’t exactly compare the growth of the human versus the robotic workforce. But from the fourth quarter of 2015 through the third quarter of 2016, Amazon reported a 46 percent, 12-month increase on average in staffers, not counting temporary recruits. The bump in Amazon’s robot holdings showcases the company’s love for automation. 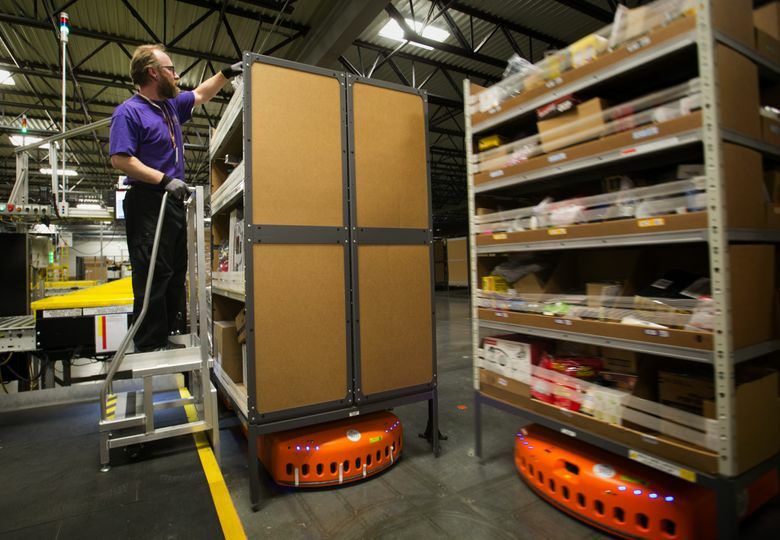 In 2012 the company bought Kiva Systems, a Boston-area robotics firm that invented the flat, toaster-like warehouse robots that now populate Amazon’s warehouses. There are also other kinds of automata, such as arms that carry pallets. But most of the stowing and picking of items, which require fine motor skills and discernment, is done by human brains and hands. For now. Also, if one hears Amazon’s top brass talk about it, the robot army still has much that is experimental about it. One thing to keep in mind: Amazon’s experiments with automation extend well beyond the warehouse — into fields like artificial intelligence and computer vision, which have led the company to open a cashierless store in Seattle. In the U.K., Amazon announced its first delivery via automated drone.